You know the problem with niche marketing? It’s deciding WHICH niche to get into. Selecting a niche involves a weird mixture of having the confidence to select a niche based on your own solid research combined with watching the market, stealing ideas and good old fashioned gut feeling. Which is also why I love it. I’ve always been a bit of a magpie, collecting all sorts of shiny information from wherever I can grab it and putting it together in my own style. You know the most common characteristics I find with the niche marketers I work with? They always think the grass is greener on the other side. Someone else’s niche is always more profitable…or at least they think so. The bugger of it is that I do it myself too! 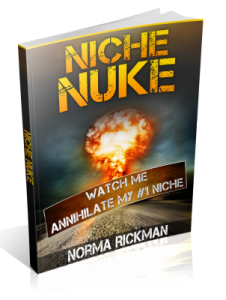 If I’m having some success in a niche and I mention it to my marketing mates or other marketers, I’ll bet you a hundred quid that within a week a few of them build a site in the very same niche. Just out of curiosity to be honest. The product creator reckons she’s found the ONLY niche you’ll ever need. Big words I’m sure you’ll agree, but I honestly do think that we could all get involved in this niche and not bump into one another too much. 5. Imagine a niche where it is so broad, the sub- niches are bigger than most niches alone. If you’re the type of marketer who finds it hard to make a decision about which niche to get into, based on your own research then this is probably for you. If you’re already having success with Adsense then you’re probably better off just continuing what you’re doing, and not getting sidetracked with other niches. Personally, I WILL be making more sites in this niche, because it’s ideal for me. My advice would be to check out more details at the link below and see what you think.